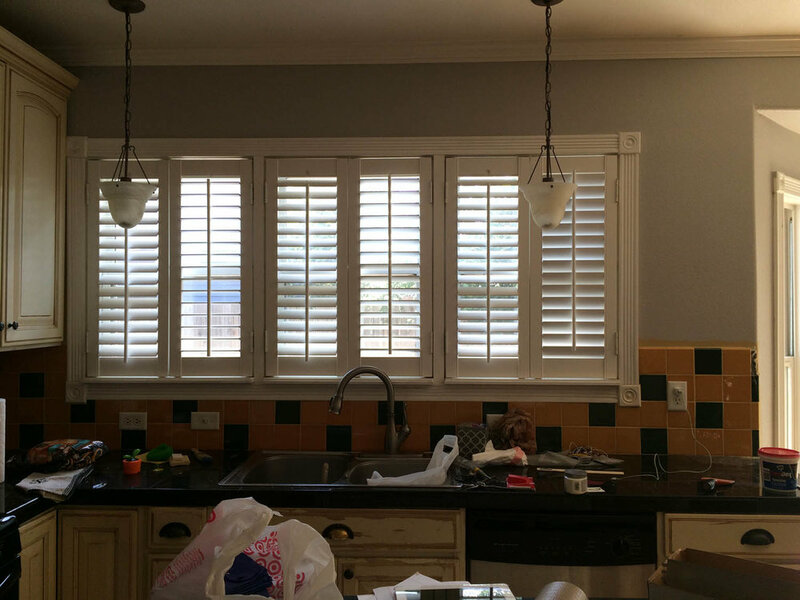 Kitchen remodel: updating the finishes while maintaining character. In my last blog post about my Curtice Cottage home remodel, I mentioned that several years ago I purchased my house because it was the perfect project for me. There would be no knocking down walls or pulling up floors so I figured I could live there while taking my time working on the house. I've lived through MUCH worse and I love having projects...in this house there were enough "projects" to keep me busy for a while! One of my favorite things to do in a remodel is the kitchen. My kitchen is right in the middle of the house which makes it the perfect gathering place. People always congregate in kitchens! In my family the kitchen is often used as a place to do homework or computer work or peruse a magazine or newspaper. Measuring for the marble countertop template. The Curtice kitchen was in poor shape and very dirty. I decided to keep the old cabinets which I knew would look good after I updated the other things. 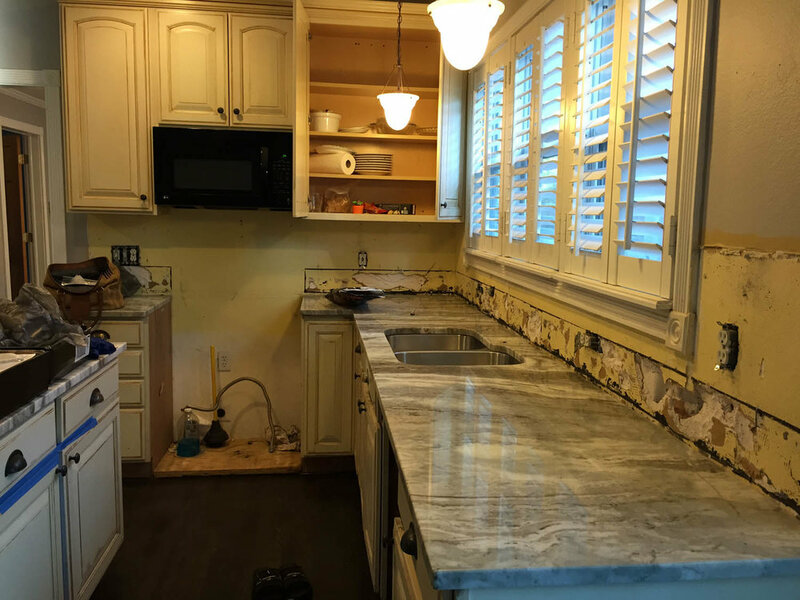 Some of the cabinets were barely hanging on hinges, knobs were missing, and the rustic distressing on the cabinets was REAL distressing from years of use and water damage. I debated replacing the cabinets or painting them. I decided to keep them and use them as a starting point for my kitchen remodel. Cleaning out the cabinets was the worst part. They were unbelievably dirty after years of use. With my long sturdy gloves on, I even pulled out a couple dead "critters" out of the cabinets. I spent many hours cleaning and disinfecting those cabinets! New appliances were purchased but I'd need to get the floors stained and countertops installed before appliances could go in. There were so many projects going on at once and the house was in complete disarray. I had to just remember it would all be worth it! The marble countertops were installed (Fantasy Brown Marble). I love this marble and have used it in four kitchens now. It's polished marble and once it's sealed it's as stain resistant as granite. I get the question a lot about marble versus granite when my clients ask about countertop materials. Marble is a softer stone and especially if it's honed (not polished) it can be prone to scratches and stains. Personally I like the look of a "weathered" marble but with this Fantasy Brown Marble I wouldn't have to worry at all. As soon as countertops were in I installed the backsplash. I used an ogee tile pattern in an off-white color which would pull together the white and brown steaks in the marble with the rustic cabinets that have a brown tint. It was a tricky decision since my walls would be grey but it turned out great! Then I added the faucet so I'd finally be able to use my sink...yippie! I chose a polished chrome fixture from Kohler that goes perfectly with my double bowl stainless steel sink. After my hardwood floors were stained, I installed the appliances which all had stainless steel finishes and then I took an entire day to organize the kitchen—one of the most important areas of my house. What a relief! Stay tuned for the next Curtice Cottage post where I'll share some of my wallpapering and painting stories! Have you done a kitchen remodel? I'd love for you to share your stories or photos—feel free to comment below or send me an email!